World Day to Combat Desertification (WDCD) is observed every year on 17 June all over the world. The aim of the United Nations in designating a day of observance is to sensitize the public and policy makers to the increasing dangers of desertification, land degradation and drought for the international community. Observance events are designed to get everyone to undertake at least one action each year to help minimize the threat highlighted. Because 2011 is the International Year on Forests, this year’s WDCD will focus specifically on the forests in the drylands areas of the world. Environmental film director John Liu, creator of "Hope in a Changing Climate", has created a 12-minute film to celebrate the World Day to Combat Desertification (WDCD), which is observed this year with the slogan "Forests keep drylands working". 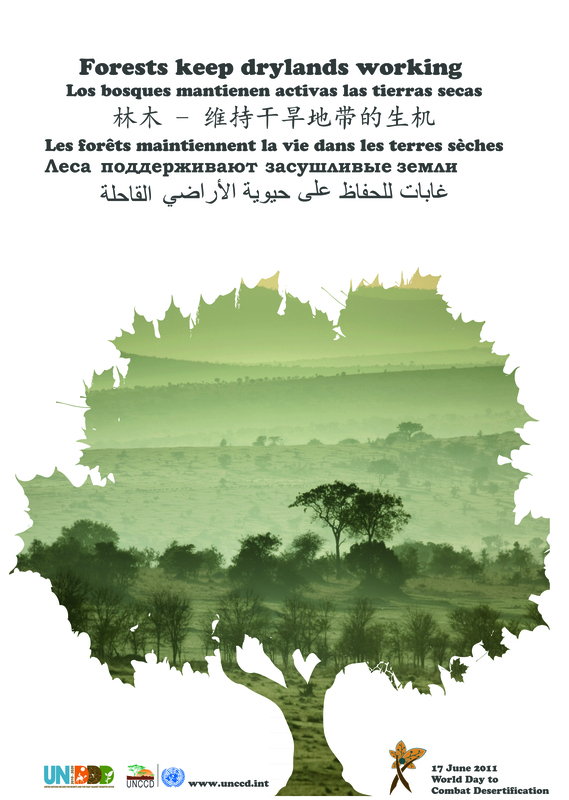 Watch the 2011 WDCD film "Forests keep drylands working"
Desertification, land degradation and drought (DLDD) threaten human security by depriving people of the means to decent livelihoods. They undercut food production, access to water and the means to economic activity, and even destroy their homes. At worst, they lead to a breakdown in national and regional security as people are forced to leave their homes or to engage in low- or high-level intensity conflicts over increased or extended periods of resource scarcity. Land degradation in the drylands, commonly known as desertification, begins with the clearing of vegetation, which means “forests are the first step towards healing the drylands and protecting them from desertification and drought,” as Mr. Luc Gnacadja, Executive Secretary of the United Nations Convention to Combat Desertification (UNCCD) observes. Dry forests may become the single most important determinant of the future sustainability of the drylands as the impacts of climate change escalate. Yet, only 18% of the drylands is forested. The United Nations has designated 2011 as the International Year of Forests to stress the need for forests that serve people. Scientists and experts agree that this link is most evident and felt in the drylands where trees play multiple roles for the communities. They provide food and medicine for the people and their livestock. They are their places of worship and shelter and their decision-making centers. Trees mean life here and are not taken for granted by the close to 2 billion inhabitants that call drylands ‘home’. In his call to the international community in February when unveiling the 2011 theme, Mr. Gnacadja stated, "If each of us makes the commitment and ensures that just one tree is planted in a degraded part of the drylands and that the tree survives through the year, we could have well over two billion trees in the drylands by the end of the year. That is a tree for every inhabitant. Let us go forth and forest the drylands to keep them working for present and future generations. Plant for your future – celebrate World Day to Combat Desertification 2011!